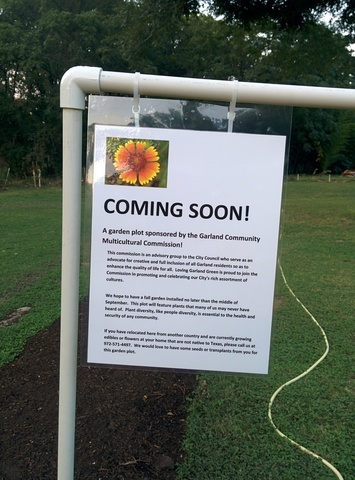 A garden plot sponsored by the Garland Multicultural Commission is coming soon to the Garland Community Garden. The purpose of our meeting today was to make further plans regarding the establishment of a multicultural garden plot at the Garland Community Garden. 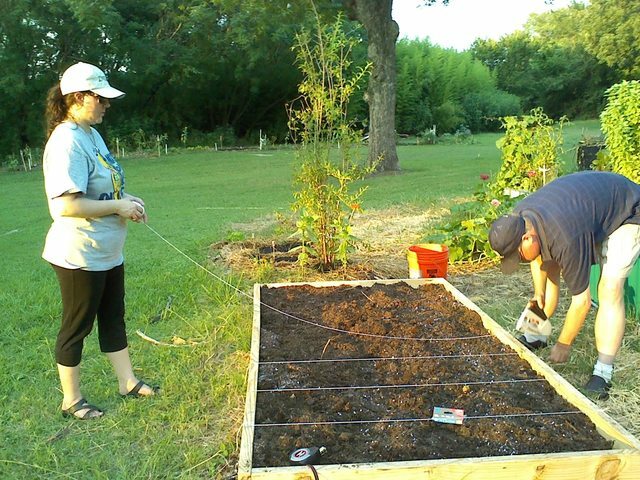 To date, Loving Garland Green members have created the basic layers of a lasagna bed--four feet wide and twenty feet long. The only things missing are the top layer of garden soil and the plants. We hope to obtain plants from immigrants from other countries who live in Garland. These would be plants that perhaps they brought with them from their country of origin--plants that most of us native Texans never heard of, yet grow well in our climate. 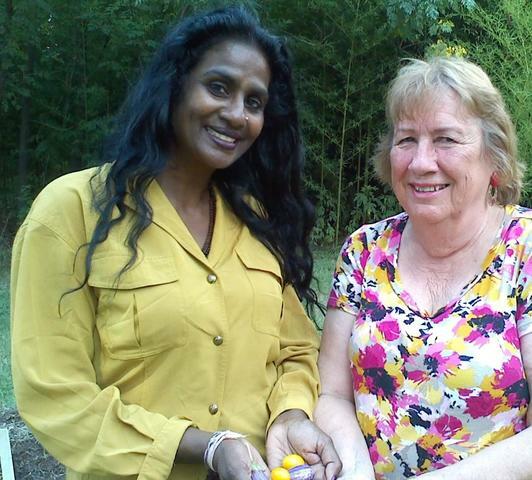 So, if you have a neighbor, or if perhaps you are one of the thousands of immigrants in Garland who has a plant from your garden to share, please call me at 972-571-4497 and I'll pass your contact information on to Nancy and Kausha. And a funny thing happened on the way to the garden: We figured out what our first plant donation for the multicultural garden would be! Sometimes we are so close to our faces that we cannot see our noses. As we were brainstorming about the various community cultural centers and places for obtaining these plants, I asked Kausha if she grew any plants unusual to Texans in her garden. The answer was yes. Kausha grows gotu kola (Centella Asiatica). It is also known as the Asiatic pennywort or Indian pennywort in English, among various other names in other languages. is a small, annual herb. It is used as a leafy green in Sri Lankan cuisine. A traditional accompaniment to rice and curry, it goes especially well with vegetarian dishes, such as dhai and pumpkin curry. Gotu Kola is considered quite nutritious. Thus we selected the first plant to be included in the Garland Multicultural Commission's Garden. Kausha has also promised a few Gotu Kola recipes. From each contributor, in addition to the plant, we hope to obtain a few recipes that we can share on the Loving Garland Green website along with some of their memories of gardens and gardeners. I know that Kausha's mother was an avid gardener so I'm hoping we can get a story from her about her mother's garden. We are considering the possibility of perhaps creating a series of these stories--perhaps for Channel 13. NOTE: It has been called to my attention the Garland Multicultural Commission has not yet voted on whether they will sponsor this garden plot, thus their sponsorship of this plot is not official just yet. My error. I understood that sponsorship had been approved. 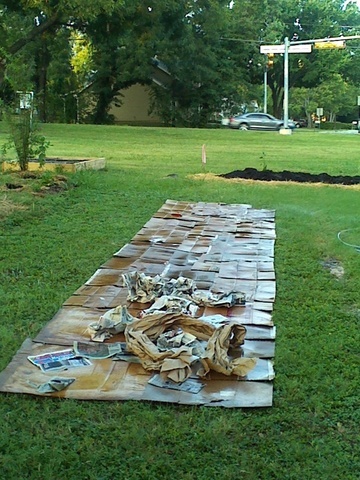 A work in progress at the Garland Community Garden 4022 Naaman School Road: The photo above illustrates the completed first layer of wet cardboard and the beginning of the second layer of crumpled newspapers. Since this photo was taken, three more layers have been added to this four foot by twenty foot plot which we hope will become the garden plot to be sponsored by members of the Garland Multicultural Commission. It looks more like a garden plot today; however there are still layers of soil and organic matter to be added before the plants are installed. Come visit the garden and see. I’m deeply honored to have been selected as one of the presenters at the Annual Neighborhood Summit in October here in Garland on October 25. This morning as I was working on that presentation, my thoughts naturally turned to how ordinary individuals can and are raising up the power and beauty of their local place. Something is stirring. People around the world are deciding the well being of their local community and its economy lies with them. They’re people like us. They’ve had enough, and, rather than waiting for permission, they’re getting together with friends and neighbors, and doing something about it. They’re finding that just doing something can transform their neighborhoods and their lives. The Power of Just Doing Stuff, a book written by Rob Hopkins, co-founder of Transition Town, argues that this shift represents the seeds of a new economy – the answer to our desperate search for a new way forward – and at its heart is people deciding that change starts with them. Communities worldwide are already modeling a more local economy rooted in place, in well being, in entrepreneurship and in creativity. And it works. It is liberating and empowering to actually start doing something by acting out the role as an example. I know because that’s how I felt in June of 2013 when I dug up most of my front yard and replaced it with edible plants. Here in the USA we often hear discussions regarding how we can be “more competitive.” I personally don’t believe that is the right question to be asking and asking the wrong questions ultimately leads us down the wrong path. In order for the USA to have a competitive labor market according to the standards set by multinational corporations in our oil-based economy, we would have to pay American workers $65 a week as they do today in a maquiladora in Juarez operated by Ottawa Leather Company (headquartered in Michigan). We also would need to be OK with working conditions such as demonstrated by factories in Bangladesh. That is the extent to which we would have to lower our standards in order to be competitive. Will that day come in the USA? I hope not. I’m working my heart out to grow new local solutions to see that it does not. Perhaps a better question for us to be asking is: How can we become more collaborative? Yesterday, at the Garland Marketplace, Mayor Doug Athas stopped by to chat with members of Loving Garland Green at our booth. We are fortunate to have a mayor who understands and cares about the power of place and the power of local. We chatted briefly about some of the upcoming plans in the works for the city of Garland—very exciting stuff. We may soon be having our own local commercial aquaponics farm. We may soon see our downtown square transformed into a green and lovely people-friendly space. The Mayor spoke of the possibility of having a large (huge) blackboard or white board somewhere on the square. People would be invited to write messages on the board. Here is a work project for some enterprising citizen: If indeed we do put up such a space, a journalist could document the 365 days of the year with a photo of the message board (or perhaps weekly entries with a page of comments would suffice) to create a book. “Reality” is ultimately designed by those who are daring enough to create it. We all have that power and imagination and it looks like more of us are choosing to exercise it. 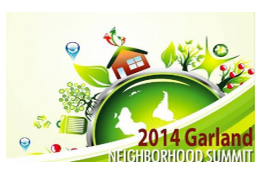 By the way, if you haven’t yet, sign up for the Garland Neighborhood Summit. It is to be held on Saturday October 25 at The Hyatt Place here in Garland. The theme for 2014 is “Paths that Lead to Neighborhood Excellence." Registration fee is $25, which is cheap when you consider that includes a great continental breakfast, lunch, the opportunity to participate in learning activities with your neighbors, and perhaps even the redirection of your life to a more rewarding path. I attended the one last year and believe me; I’ll never miss another as long as I live in Garland. Call the Garland Office of Neighborhood Vitality for more information: 972-205-2445. Last year's keynote speaker, Peter Kageyama, author of Loving Your City, conducted a workshop to explore how people connect within their own community and how to improve and maximize that connection in order to lead more people toward being “in love” with their place. It was out of inspiration from that summit and Mr. Kageyama's presentation that Loving Garland Green was born. According to him, the importance of loving our place is often overlooked by city planners when they are considering how to improve their community. In fact, the word "love" is often not even in the vocabulary of their literature. Yet we all know the importance of love. The things and people we love are the things we focus on, cherish and take good care of. Love needs to become part of the vocabulary for local if we hope to raise up our community. Gardens are like rivers. You can never step into the same one twice. So it goes with the Garland Community Garden at 4022 Naaman School Road. 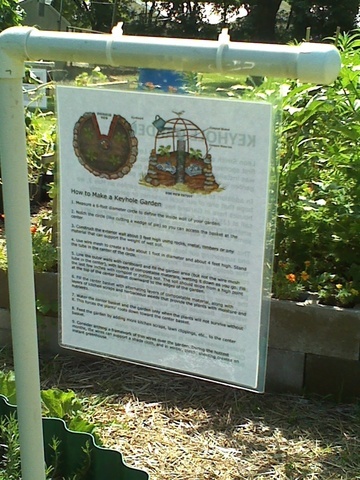 In the last week we have added another square foot garden, a pumpkin patch and seven signs throughout the garden. In addition, we have planted numerous seeds and new plants--among them are three blackberry bushes. We hope to see you at the Garland Marketplace this Saturday, August 16. Loving Garland Green will have our own booth at this monthly community event. 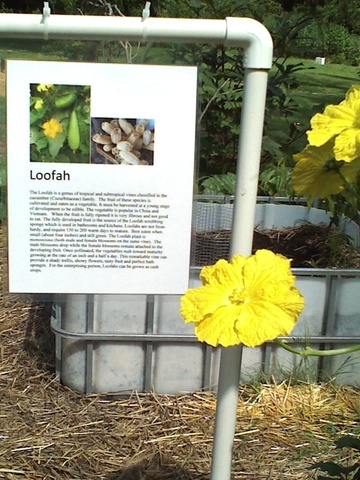 Frankly I'm surprised that we don't see more loofah vines growing in the DFW area. This garden is approximately 160 feet long and 4 feet wide. It was created lasagna style. Instead of digging up the earth, layers of cardboard, newspaper and other carbon layers such as dry leaves and sticks are alternated in layers along with some green organic matter such as green leaves and vegetable scraps. The ratio is 80% brown matter to 20% green matter. These layers are put right on top of the grass. A mixture of garden soil and compost forms the top four to six inches. Ideally, these beds are at least 8 inches high. Among a variety of vegetables, we have 14 tomato plants in this area--most of which are Sun Gold tomatoes. Sun Golds are a hearty, prolific, disease resistant variety. As for taste: they can't be beat. In fact, you could serve Sun Golds as dessert in some circles and get away with it. These plants bear the sweet fruit well into fall until the first frost and also make a great fall-planted crop in warm regions such as ours. 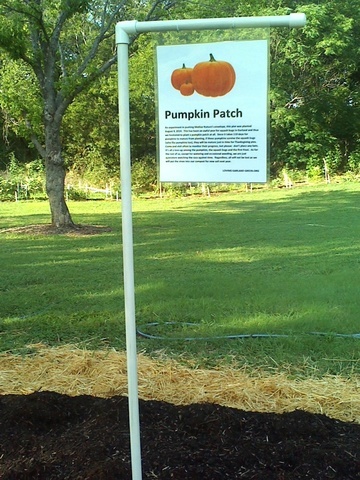 August 10, 2014 the pumpkin patch at the Garland Community Garden was born. The pumpkin seeds were donated by Ken Risser of Keep Garland Beautiful. Ken, an intelligent high-energy guy, dropped by with the seeds and suggested that we needed a pumpkin patch. We agreed. The rest is history--except for growing our relationship with Ken and the folks from Keep Garland Beautiful. Keep Garland Beautiful is a 501(c)(3) non-profit organization dedicated to create a clean, beautiful, litter-free Garland through education, public awareness and community involvement. Their community outreach programs help adult citizens and young people better understand why litter is a problem and how they can play an active role in litter prevention and removal and community beautification. KGB is governed by a volunteer Board of Directors and is a division of the City of Garland Environmental Waste Services Department. KGB, an affiliate of Keep Texas Beautiful and Keep America Beautiful, is an award-winning state and national program. Visit the garden often and watch the pumpkins grow. The patch is definitely an experiment in pushing Mother Nature’s envelope as it was planted August 10. This has been an awful year for squash bugs in Garland and thus we hesitated to plant a pumpkin patch at all. Since it takes 110 days for pumpkins to mature from planting, if these pumpkins survive the squash bugs (who like pumpkins too), they will be mature just in time for Thanksgiving pies. Come and visit often to monitor their progress, but please: don’t place any bets. It’s all a toss-up among the pumpkins, the squash bugs and the first frost. As for the rest of us, except for watering and occasional weeding, we are just spectators watching the race against time. Regardless, all will not be lost as we will put the vines into our compost for new soil next year. One of our new garden signs tells visitors how to build their own keyhole garden. As far as we know, the Garland Community Garden currently has the distinction of being the only community garden on Garland City property and is the only community garden in Garland with a keyhole garden. Leon Smith of Clayton Texas donated this keyhole garden to us. You can read more about Leon and this garden design at the Garland Community Garden and at Loving Garland Green.org. Our new banner will be featured at our Garland Marketplace booth this Saturday. We hope you will stop by. The design of this banner is a group effort involving Ken Dyer who designed the Loving Garland Green logo, Liz Berry who created the layout, Robert Opel who added the artistic sunburst background and corrected the dpi resolution, and Anita Opel who managed this project. Charlie and I are currently writing a book, complete with photos of all the various types of edibles that we've had great success in growing in our own gardens and also down at the Garland Community Garden (4022 Naaman School Road). Here is a section from it on tomatoes to grow well in our local area. One caveat regarding "grow well": Provided the soil has been properly amended. Just sticking your plants into unamended Garland clay won't work. Tomatoes prefer soil that is slightly acid with a pH from 6.0 to 6.6. 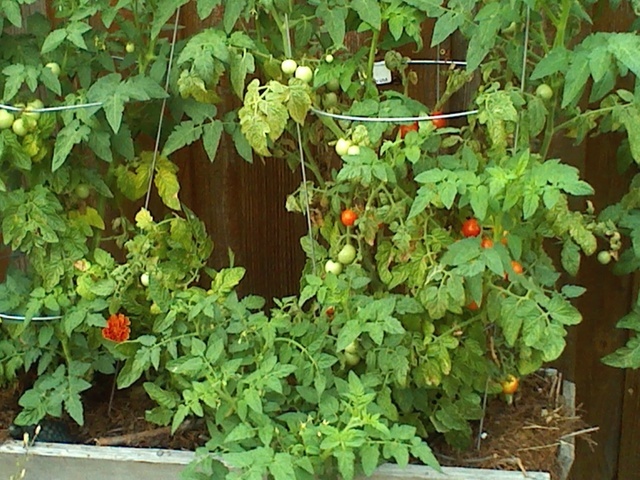 And like most plants, tomatoes prefer loose soil that drains well--not too fast and not too slow. Tomatoes can be categorized as hybrid or heirloom. They can further be classified as determinate or indeterminate. Determinate varieties are sometimes called "bush" tomatoes. They grow to heights of three to four feet and are about two feet wide. Indeterminate varieties are sometimes called "vine" tomatoes. They can grow to heights of up to 10 feet (although most stop at about six feet) and will continue to produce fruit until the first frost. 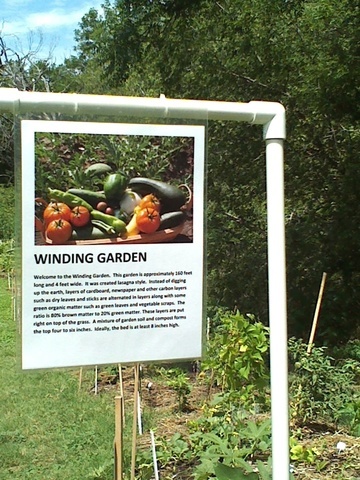 Hybrid and Heirloom can be emotional topics among organic gardeners. Some folks mistakenly conclude that a hybrid plant is the same as a GMO plant. They are mistaken. Cross-pollination is a natural process of crosses within the same plant species. It also occurs naturally in nature. GMOs most often mix genes from other species. Hybrids do make seeds but they do not "breed true." They do not produce seeds that will grow into plants exactly like themselves, because in the next generation, the genes have segregated into many new combinations. Heirlooms are much more reliable in term of producing like plants. Heirlooms come from seeds that have been handed down from generation to generation in a particular region. Heirloom vegetables are open pollinated (by insects or the wind). Many say that heirloom vegetable varieties have the best taste; however, the downside of an heirloom is that its crop yields are not as predictable as those of the hybrid and often the vegetables are not uniform in appearance like those in the grocery store. At the Garland Community Garden we have three heirloom tomato plants. 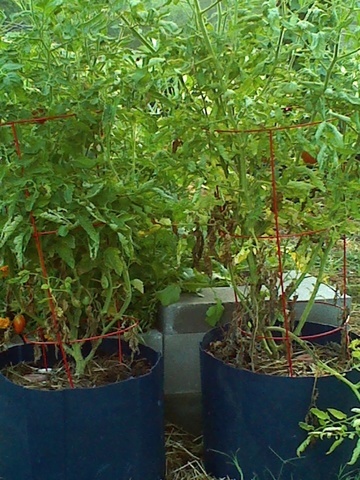 One is a Roma tomato that is growing in the blue pot on the left as you face the front of the concrete raised bed. We also have two additional heirloom tomatoes growing in the square foot garden. Both of these are cherry tomatoes. While heirlooms are more likely to produce plants exactly like the plant that produced its seed, this is not always the case. It is possible for a plant (even an heirloom) to cross pollinate with a plant near to it and thus yield a different tasting vegetable the next season. Peppers, for example, are notorious for cross pollinating. If you plant Bell pepper or sweet pepper by a hot pepper such as a Habanera, you will end up with some hot (or hotter than usual) Bell peppers next year if you use those Bell pepper seeds. I couldn't agree more with the Texas A&M AgriLife Extension Service who named the Tycoon tomato a Texas Superstar because of its strong disease package and desirable consumer traits. David Rodriguez, a Bexar County AgriLife Extension agent and a member of the Texas Superstar selection board, said the variety is resistant to tomato yellow leaf curl virus, which has become a problem for many other varieties in recent years, according to a news release. The Tycoon is touted as being even better than the Celebrity--a very popular commercial hybrid. It is very meaty and tasty. 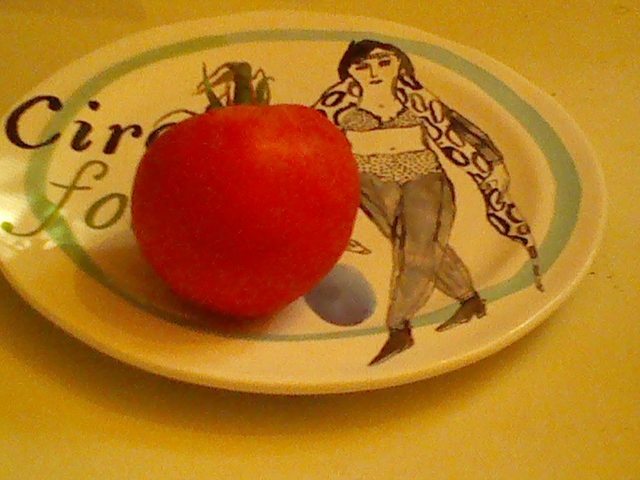 The tycoons I planted are producing medium-sized perfect tomatoes as you can see from the photo above of a tomato I harvested from the Garland Community Garden. The tomato is flawless. It is very pretty--inside and out. I purchased the Tycoons as small plants at the Bruce Miller nursery in Richardson, Texas. These tomatoes are another recommendation from me. As you can see from the photo above which was taken in the Garland Community Garden this morning, the Phoenix is quite prolific. My plants came from Harry's Greenhouse in Weatherford Texas. They are drought resistant and hardy plants. Phoenix tomatoes won't crack. On top of that, the tomato is tasty. I purchased them at Bruce Millers on Beltline in Richardson Texas earlier this spring. 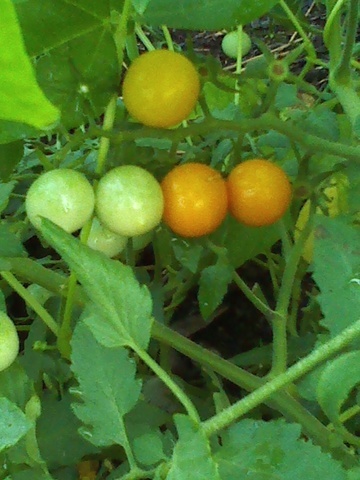 As for cherry tomatoes, Sun Golds are a hearty, prolific, disease resistant variety. As for taste: they can't be beat. In fact, you could serve Sun Golds as dessert in some circles and get away with it. These plants bear the sweet fruit well into fall and also make a great fall-planted crop in warm regions. If space is tight, try Sun Gold in containers—big ones 20 to 24 inches in diameter to fit the big plant.You won't be disappointed. 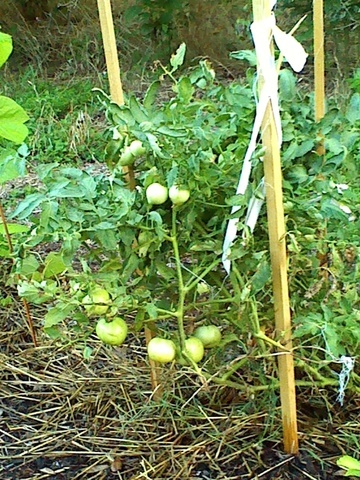 Plants definitely need staking or tall cafes; gardeners report this tomato to grow as tall as 10 feet. The indeterminate vines are resistant to many diseases: verticillium wilt (V), fusarium (F), and tobacco mosaic virus. Sun Golds are said to reach heights of up to 10 feet--although most stop at about six feet. These plant definitely need to be staked and/or trellised. Yes, you can grow tomatoes in pots. No, you are not limited to "Patio" varieties. 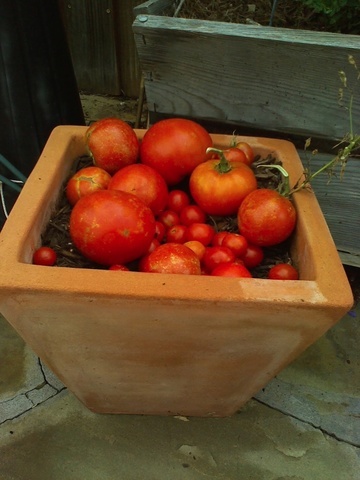 As for growing tomatoes in pots, don't let anyone tell you it can't be done! Any tomato that can be grown in the soil can be grown in a pot. Some of the best tomatoes I've grown have been in pots. Again, a key element is your soil. For my potted plants I always make sure to have a ratio of 1/3 vermiculite to my soil so that it stays loose and fluffy thus providing the opportunity for plenty of oxygen for the roots. 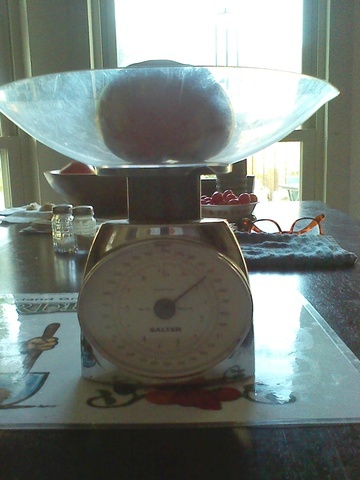 Another important consideration is the size of the pot. Ideally the container should be no smaller than 8 gallons; but I have seen great tomatoes growing in a five gallon homer bucket (with lots of holes drilled in the bottom for drainage). Two huge healthy heirloom tomato plants growing in recycled trash barrels at the Garland Community Garden. When it comes to prolific tomato production, Charlie is the undisputed champion--at least among the members of Loving Garland Green. Thus far this year his garden has yielded over 130 pounds of tomatoes and all his plants are still producing. This is all the more remarkable if you will consider that his garden consists of raised beds built on flagstone around his swimming pool. Charlie sticks with the traditional commercial hybrids: Celebrity, Better Boy and Husky (a cherry tomato). After I've seen Charlie's Better Boy plants in action this year, I'm definitely trying one of these plants next year. One Better Boy plant once yielded more than 340 pounds (154 kg) of fruit, earning it a Guinness World Record. It's common for a Better Boy plant to yield 16 ounce tomatoes. Charlie had several that weighed a pound and more this year. The tomatoes are perfect for slicing, canning and making into sauces. These plants need at least one inch (2.5 cm) of water per week and prefer six hours or more of direct sun each day. Better Boys are indeterminate hybrids that can reach 6 to 8 feet tall. They need to be staked. These plants are tidy and compact--thus making them ideal for containers. And yes, they are delicious too. They are about one inch in diameter--just the right size for popping into one's mouth whole. I call them "Junior" tomatoes because they have all the traditional slightly acidic taste of a larger tomato which is unlike the Sun Gold cherry tomatoes which are entirely and wonderfully sweet. Next year I'll have a Husky and a Sun Gold plant. Like the Better Boy, the Celebrity tomatoes are also tasty and prolific. However, they are my least favorite of all the varieties of tomatoes that we have grown this year. Their skin is a little tough and the tops of these tomatoes have a tendency to split prior to ripening--thus making them easy targets for insects. But I may not be fair here. We've had an unusual summer with some hot weather followed up by heavy rains. When this happens, the tomato can absorb too much water through its stem scar, thus causing the fruit to split in a radial pattern around the stem. Charlie might give them a second chance next year, but I won't.